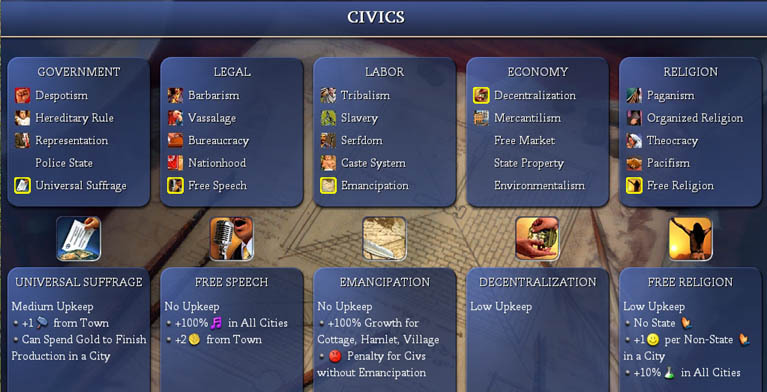 Inbetween golden age management, I also took the time to change civics again. I adopted universal suffrage, emancipation, free speech, and free religion, all geared towards an empire at peace with maximum science output. Unfortuntately I hadn't researched economics yet, so I wasn't able to adopt free markets to optimize my cashflow - the tech wasn't really necessary on my way to Alpha Centauri, and the AIs had discovered it already but were unwilling to trade at the moment, so I decided to wait until they would be willing to. Somewhat counterproductive was my inattention towards my cities, though. I researched, improved my lands, gave construction orders (improving my economy or science output) etc., until around 1610AD, when I began to wonder why Boston was still sitting at size 10 all the time, despite having farms around it? I zoomed into the city, and saw that I was producing 14(!) extra food per turn! Then, to my horror, I saw that the "avoid growth" option was somehow checked! I made some trades, some of them in favor of the AIs, but I didn't care, given how far ahead I was. I really like the new tech tree, that you can be ahead and yet still lack some older techs to trade for! My workers were now chopping forests all over the place to speed up the building of wonders and improvements. All the tiles in the 21-tile-radius of my cities were improved now, but forests not in the direct vicinity of cities still give hammers to the nearest city when chopped, so this was worth it (although I heard the green party protesting...). This gets old real fast! In 1655AD, Greece moved a war elephant and a catapult through my lands (we had an open border agreement because, naive as I was, I still hoped to come to better terms with him) to the south of the continent. And then he declared war, again. Actually, this had been quite clever, because my cultural borders hadn't covered everything yet down there, so he moved the units towards the not-so-heavily-defended San Francisco, declared, and only got thrown out a few tiles away. Now if he had brought more than just an elephant and a catapult, it would have been really clever (but then I'd have shadowed him with a strike force of myself). But regarding "sneak" attacks, it looks like the AI still hasn't learned to bring more than one or two units, just like in Civ 3. My combat II pikeman from San Francisco gets rid of the elephant, and one turn later, a combat II swordman from Seattle kills the catapult - south safe again, thank you. A knight, a war elephant, two crossbowmen and a catapult marched towards New York - actually a nice combined arms stack. But two catapults from myself, plus four knights and a pikeman make short work of that stack, and after that, my slipped-in rifling tech came in, and my newly produced riflemen made this war a non-issue. I still refused to attack Greece though, as combat wasn't the focus of this game, and made peace again in 1700AD. During the next decades, I researched like mad, made some trades (didn't care whether they were fair or not), caved in to several tech demands, but refused to adopt any civic I didn't want to, or to stop trading with India, as the Incans suggested several times. Railroads were discovered in 1745AD, and the statue of liberty erected during the same year - a free specialist in every city is nice! In 1805AD, I entered the modern age. A 3rd great person appeared a turn later, and so I was able to spark my 3rd golden age. I peacefully constructed all necessary spaceship parts until 1936AD, when during the construction of the last part, Greece declared war one last time. This time, he had two artillery, a grenadier, a knight and an elephant - not really impressive. Typically for my style of playing, I still had exactly the same units I had last war, but had such a strong economy that I had been able to run 100% science while still generating a positive cashflow. So about 2000 gold were spent upgrading old units to infantry, and I also produced four tanks to play around with, making short work of anything he entered my territory with. Sorry that the end-game reads so anticlimatic, but it looks like Noble isn't really a challenge. In my hasty rush to launching the spaceship, I even made several mistakes due to laziness, like not switching to bureaucracy to complete the last part (the docking bay) sooner. Anyway, in 1975AD, finally the game was over. The replay was a bit strange: The only wars had been the four times Greece had declared upon me. Apart from that, the only noteworthy thing that had happened was that a Japanese city had flipped to the Incans - the rest was only wonder building and great person spawning. I hope games on higher levels will be a bit more...exciting. Actually, I found the ease I had won this game slightly worrying. As I understand it, the AI won't get more intelligence on higher levels, only more advantages in form of free units, production and research boosts etc. On Noble, I had no advantages over the AI, didn't know the game, made lots of mistakes, and even willingly ignored some game features, like not touching the culture/happiness slider until I had researched all techs I needed. I also ignored specialists in cities for the largest part, and yet my victory was never really in danger, except maybe during the first war with Greece. 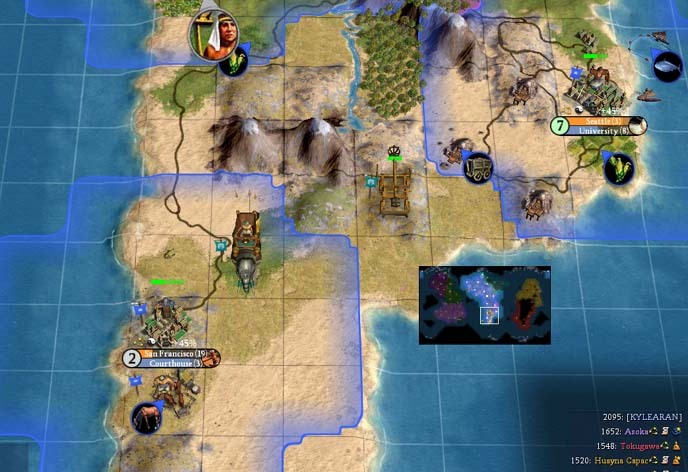 My overall impression about Civ 4 is very positive, though. 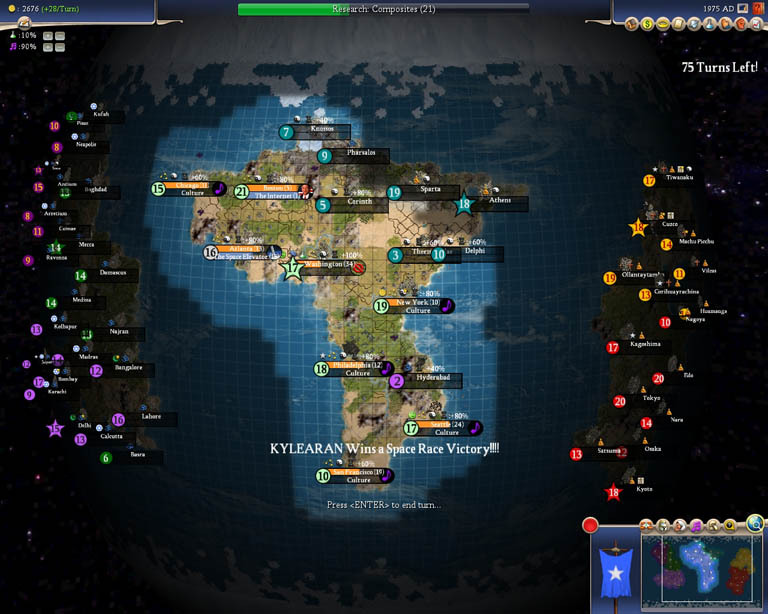 It looks like the player has a lot more options to choose from, be it the tech tree with its various fields of research, or the different kind of improvements, the richer diplomacy and the more complex military unit interaction. 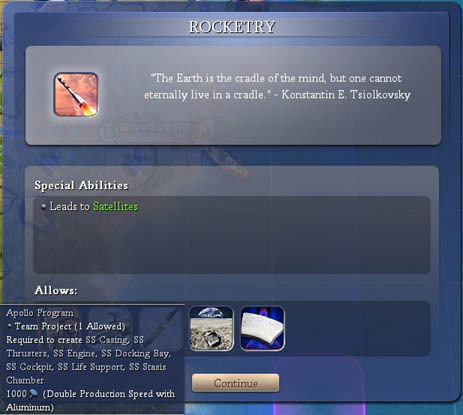 On higher levels of difficulty, I'm sure the game will be a challenge, and the higher number of units the AIs will have will probably compensate for some of the the AI is smoking. I heard that they are now capable of true and effective naval invasions, and I also liked the way they put together stacks of combined arms. But after the initial wave is over during a war ("...the civ is gassed"), it looks like it will suffer from the same problem the Civ 3 AI had: Sending in single units as soon as they get produced, and even doing silly things like attacking heavily defended cities with these single units. But with some patching, this game has great potential! It definately has that "one...more...turn" syndrome, which I like! (My wife might disagree here. ) I'm looking forward to my next game, but I think I will skip at least one level of difficulty, as I'd like to have a real challenge (and even won't mind losing). Thanks for reading! If you have questions or any comments about the game or the report, feel free to send me a mail, or post your thoughts in the forums at Realms Beyond Civilization. Hope to see you in my next game report!